Moonlit lodgepole pines cast shadows onto granite as our narrow headlamp beams finally hit something metallic in the Sierra Nevada darkness, reflections glinting off our tired faces. 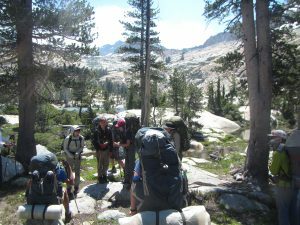 Hours before, our crew of five students and two instructors stood atop Blackcap Mountain and watched the sun slide down peaks of the John Muir Wilderness. 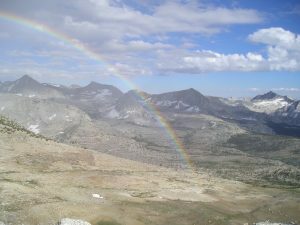 We rested in meditative gratitude for the adrenaline-pumping traverse of the Rainbow Ridge we had just completed, which included climbing above 12,000 feet, scrambling over boulders along the exposed bony ridge and celebrating a double rainbow brought on by the afternoon storms. The lingering sunlight was fading as we began our descent back to camp. 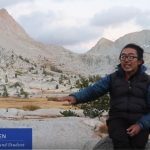 As the day’s designated navigator, I was tested on the skills I had learned so far on this 14-day mountaineering course with Outward Bound California. I grappled to match the dusky curves of rock and forest to lines on the map, while a crewmate’s conversation distracted me from my fatigue and responsibility to steer the group home. It was with surprise and relief that we recognized the sparkles caught in our headlamps as coming from our backpacking stoves, meaning our exhaustive wandering through the dark, trail-less backcountry had finally led us back to camp. It was a keenly communal sense of accomplishment that I felt that day, and throughout the course. 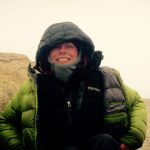 At Outward Bound I learned to be a team player; when a crewmate struggled to carry his pack over the pass, I was challenged to be supportive while irritated by our slow pace. When I felt weighed down by homesickness, the same crewmate’s encouragement brightened and inspired me. Traveling through the stunning and raw backcountry worked as a great equalizer, fostering empathy and trust for people I may never have talked to back home. For the first time in my life I couldn’t simply run ahead, and I found that I didn’t want to. That course as a teenager began with apprehension, frustration, and fear of the unfamiliar and morphed into mastery, friendship and connection with place. Outward Bound sparked in me a love for the rugged, remote and beautiful and showed me that my life could be spent working in such places. Further, I discovered that if I tapped into my potential for compassion I could change the relationships in my life and learn considerably from people with whom I had little in common. Seven years after completing that OBCA course, I am back in the John Muir Wilderness, standing on the Northeast slope of Scepter Peak and looking across a valley at the prominent spine of Rainbow Ridge. In those seven years, I graduated from high school and college. 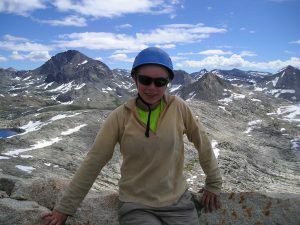 I completed personal backpacking trips, from weekend romps in the mountains near my New England childhood home to multi-month expeditions traversing the Western U.S. My instructor, one of the people who first demonstrated to me that there was meaningful work to be found in the mountains, became my staff trainer, and eventually my colleague. I have taught students how to navigate off-trail and how to effectively communicate with their peers, and we have taught each other how to live with more laughter, gratitude, and tolerance. In the months and years following August 2011, my path was consistently paved by hunger to be back in the mountains as well as a desire to help other young people uncover strength and compassion through adventuring outside. 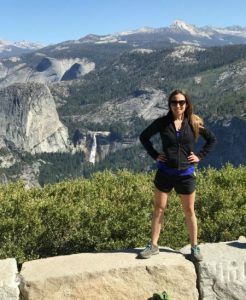 I pursued work in outdoor education so that I could facilitate opportunities for others to experience the sort of life change that I had. 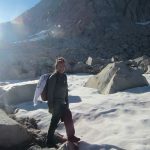 Now such work had brought me back to the Sierras as an Instructor for Outward Bound California, where I coached a group of exhausted teenagers as they navigated the slabs of Scepter Peak and attempted to travel at a pace that would keep the group together. As they stopped to rest their legs and lungs, I looked east and was transported back to my own transformative trials with mountains, teamwork, and communication. For a moment, I was back with my own crew beneath a double rainbow, thrilled by the place I stood and the community I found. But my reflection was fleeting; the students had decided it was time to get moving- we had a peak to summit and afternoon clouds were rolling in.